Eylure Dybrow In Dark Brown £9.49 The Eylure Dybrow kit is simply fantastic and possibly the best beauty find of 2015 here on BBA. It's effective, affordable and the application is fuss free. Who would have thought at home brow tinting could be so darn easy? 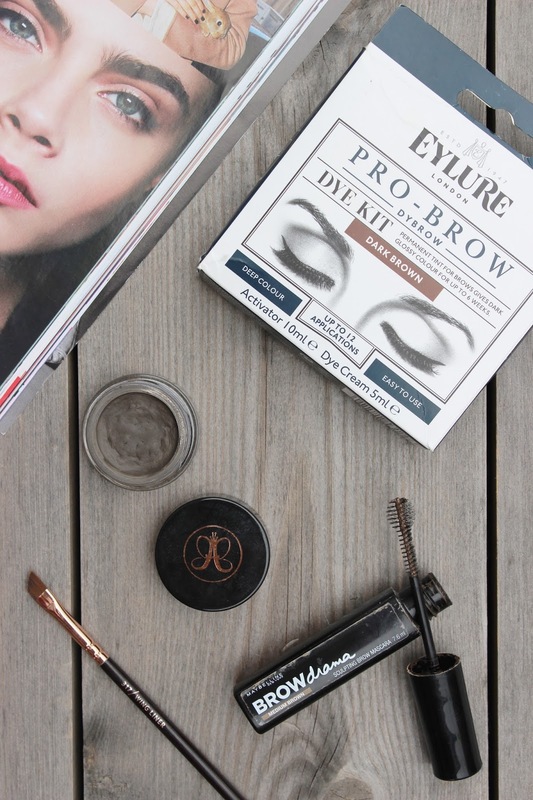 The rich brown dye helps my brows to appear naturally thicker and more shapely. Not to mention I've saved myself a small fortune - I wished I had tried it sooner! Anastasia Dipbrow Pomade £15.00 Until this pot of goodness came along from Anastasia, I was very much a powder kinda gal when it came to filling in my brows. But the Anastasia Dipbrow Pomade is a brow game changer. It does take a little practice and patience at first, but with the correct brush and right technique, this product creates beautiful brows. I wear the shade 'Medium Brown' and have no complaints with the colour - it's a great match. Unfortunately it does have the tendency to dry out, but thats nothing a little drop of baby oil doesn't fix. Nevertheless, the formula is smudge resistant, waterproof and highly pigmented, so a little goes a long way. Maybelline Brow Drama Sculpting Brow Mascara £4.99 The Maybelline Brow Drama has been a staple in my makeup bag for the past year or so and for good reason. It's a tinted brow mascara available in 3 shades and my go to brow product for a simple 'no makeup makeup look'. The brow mascara adds a little colour intensifying and defining existing brow hairs and helps them stay in place all day. The brush may be a little odd, but it makes the product effortless to apply and can be worn alone or over another brow product.